Navigation systems, iPod playback, DVD, serious music reproduction: Creative Sound's installers know how to get what you want into your vehicle. We take pride in the quality of our installers' work and are often surprised at the creativity and ingenuity they use to create some of the systems we've done for customers. With many years of experience, there are very few vehicles they can't handle. 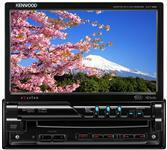 Especially with their upscale Excelon series, Kenwood car audio entertainment systems are our first choice. From simple AM/FM/CD decks to full-blown DVD/Navigation/iPod control systems with amplifiers and speakers, Kenwood excels. For over 30 years, Alpine has been one of car audio's premier lines. Their collections of head units, amps, speakers and subs are all high-performance 12 volt entertainment at its best. Famous for the finest automobile subwoofer systems, JL also offers speaker systems and amplifiers to make your car into your favorite listening room. Found in some of Europe's most prestigious automobiles, Dynaudio mobile loudspeakers are pure audio nirvana. Following the lead from their 60-year history of making the finest home amplifiers, Mac amps for your car are an experience in fidelity and power. For all the pieces and parts to install your mobile system correctly, Stinger's quality products get the job done right the first time.